I was asked after church in Bible study if I like preaching on Easter Sunday the best. My answer was not as full a yes as might be expected. It is definitely up there, if just for the crowd size. This is not meant as a theological statement – the effectiveness of any sermon comes from the Spirit in the hearer – but when you’ve got a crowd the speaker does not have to supply the energy. The most draining times to preach are when there should be at least what I call comfortably empty crowds and you are below that. (Special days like thanksgiving don’t qualify because the 10 leper rule, only 1 of 10 returned which gives a different feel.) Those times and places are energy black holes. Again not a theological statement. Easter morning is one that the speaker can reflect the crowd’s energy. But probably the bigger reason Easter is not number 1 by a landslide is that large audience. This is what I mean. The typical Sunday a preacher can feel comfortable that the Spirit is working in the lives of most of the congregation. The Word has taken root and it is the preacher’s job to water it. On Easter Sunday you get a different crowd. The fundamental job on Easter Sunday is casting the Word to the air. It is giving hard hearts and stopped up ears a chance to respond with faith. It is the gospel proclamation reduced to its core – he is risen! And while the taking root of faith and the word is the work of the Spirit, there is always a deep longing in an Easter Sermon. This might be the last time many gathered might hear the Word. This might be the last time for the Word to take root. And the Sunday after Easter you get a feedback. Too many prodigals haven’t returned. Too many seeds have been fallen on hard ground. Too many cares of the world have crowded out that He is risen. Unlike most Sundays that you know you will see much of the congregation the next week or soon, on Easter you worry. And every preacher is reminded that it is not the eloquence of the tongue but the mysterious work of the Spirit. Who never seems to work on our timetables or with the response we would like. Easter preaching is joyous and humbling at the same time. 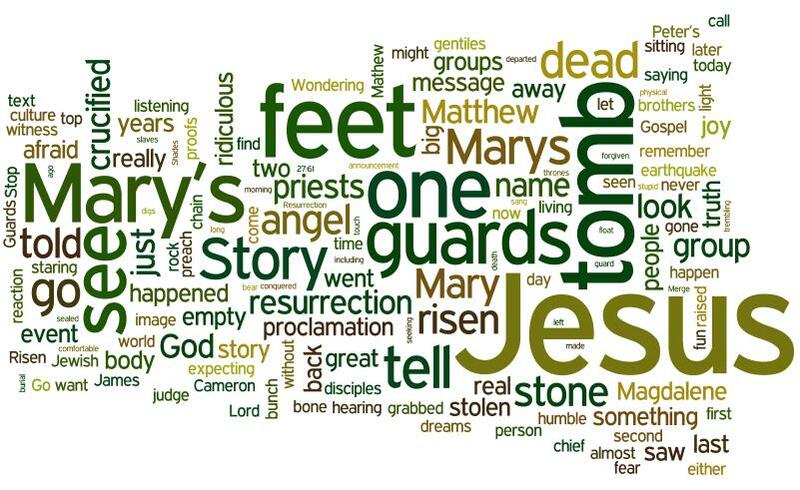 This entry was posted in Sermons and tagged Easter, grace, humility, Matthew, preaching, response, sermon, Word. Bookmark the permalink.